many compliments from our guests". The Brassworks Quintet is the perfect choice for weddings & receptions, parties, concerts and holiday events, both indoors and out. The Quintet works wonderfully in combination with organ, piano or harp in a church or cathedral setting, as well as in a natural setting. We deliver great music with a majestic sound that will make your event both exciting and memorable. The Brassworks Quintet got its start as the Strolling Brass at Great America Amusement Park, playing a variety of lively music for the crowds. The strolling/marching format has remained one of the group's specialties, making us effective entertainers at festivals, parades, street fairs, civic and corporate events. Why book a woodwind quintet or string quartet when The Brassworks Quintet can give you so much more? 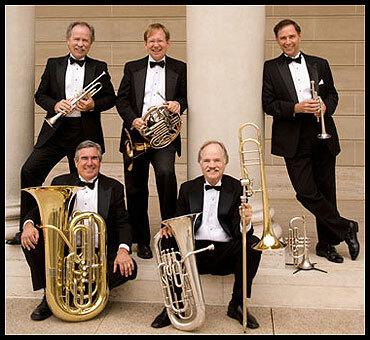 The Brassworks performs a wide range of musical styles: Renaissance, Baroque, Classical, Folk and Pop, including Marches, Ragtime, Hot Jazz & Dixieland, Blues, Swing, Rock & Roll, Motown, R&B, Latin, Broadway Show Tunes, Holiday music and Concert works. With its large classical and popular repertoire, the Quintet is particularly well suited to play for Wedding Ceremonies as well as providing background music for Cocktail Hour and Dinner. The Brassworks is versatile! With our drummer, the Brassworks Quintet becomes The Brassworks Band, effectively providing a wide range of dance music for Receptions and Dances. We also make a dynamic presentation for outdoor concerts, festivals, Holiday entertainment, corporate events and parties. 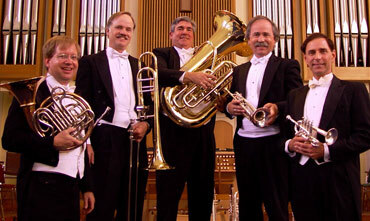 The Brassworks Band can be sized up to 8, 10, 12 or more musicians as needed. We will march in and make a BIG SPLASH at your next event! Book The Brassworks now for your event!